A lot of people are tinkering with 3D LED light displays. A common DIY project is to create an LED cube – and since each LED can be separately programmed, the lights can be animated. 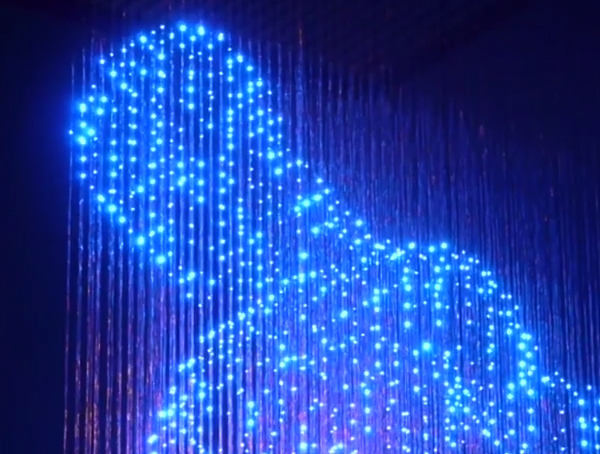 Here are 3 videos that use LED lights to create three dimensional light displays. The first one is the most impressive, as not only does is it display graphics of a person dancing, zooming in and out, but does it to the beat of the music. The second video creates motion with lights, not through programming of individual LEDs, but through a mechanical base. Last is a video of a static 3D sculpture of a man.